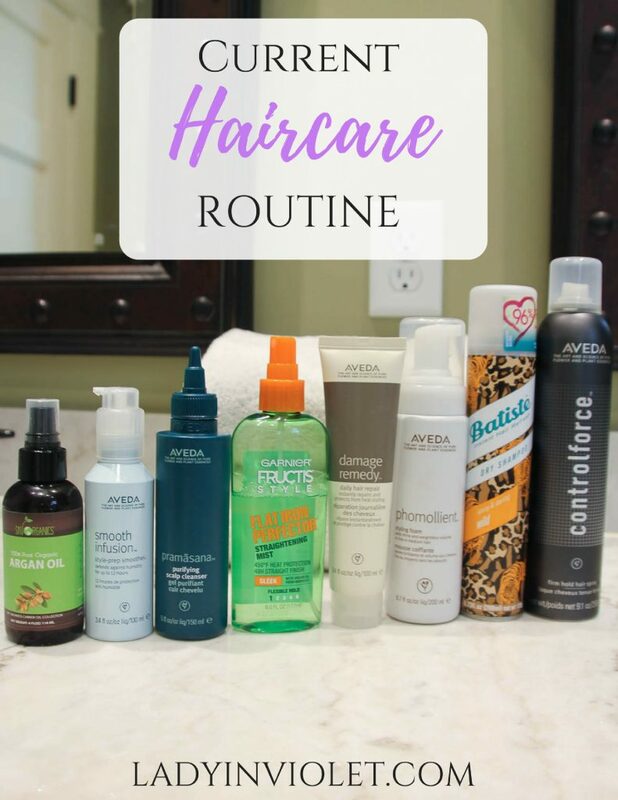 Let’s talk hair, more specifically my current haircare routine including all the products I use from post shower to curled and ready to go. About 6 or so months ago, I was pretty annoyed with my hair. For starters, I was pretty sure it was no longer growing. It had breakage and damage that kept me from the long luscious locks I desired. I started doing research on improving my hair’s health so it could grow not just longer, but stronger too. One day a box filled with Aveda goodies arrived on my doorstep, and as overly dramatic as it might sound my hair was forever changed. After using for a few months, I noticed that not only was my hair looking healthier, but a little longer and fuller too. I did make other changes to my haircare routine from hair vitamins to thickening shampoo to monthly hair masks, and I’ll share more details on that in future posts. 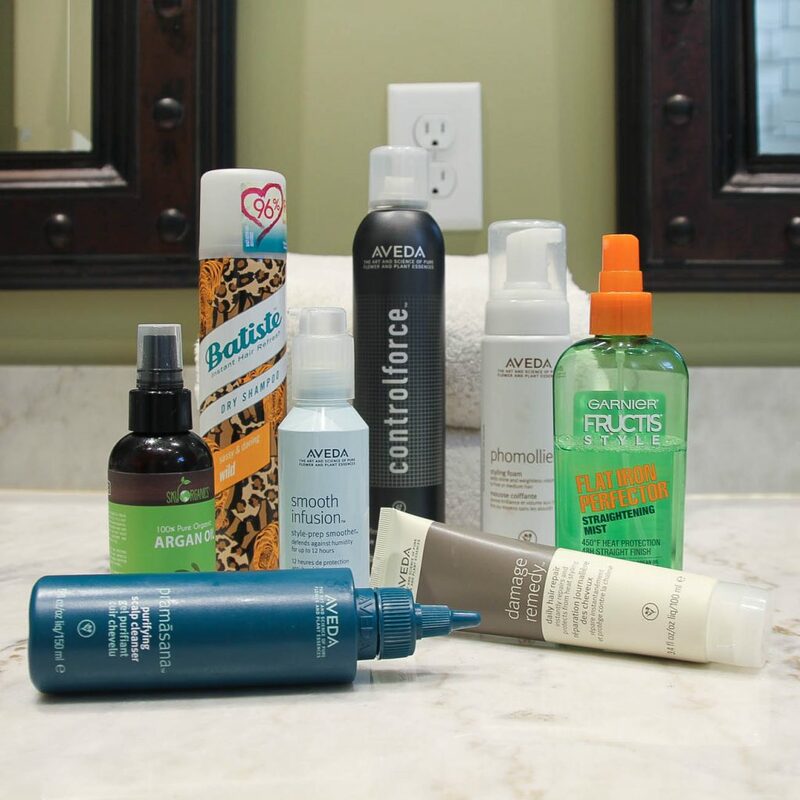 Today, I wanted to share about the styling products I use because these were the products that really started it all. Before I start on the styling products, I have to mention this scalp cleanser. I started using it around the same time I changed over to an Aveda based hair routine. I apply this to my scalp and rub in prior to washing my hair. As you are about to learn, I put lots of products on my hair, and I love using this to deep cleanse my scalp and wash away those products allowing my hair to continue growing healthy. Okay so here we go with my post shower routine. I start with this damage remedy leave in conditioner. I apply this to the length of my hair avoiding my roots and scalp area, think what would hang out of a ponytail. I only wash my hair 1-2 times a week, so I don’t want to add conditioner to my roots and possibly make them oily sooner than normal. I follow up the damage remedy with this style foam. I apply about 3-4 pumps only to my roots and scalp area of my hair. This foam adds volume and the roots of my hair is exactly where I want that volume to go. I follow the styling foam with the smooth infusion style prep. I apply this to that ponytail length of my hair. This product mentions it is anti-humidity. Honestly, it did not hold up to Houston humidity, so it’s not a product I would recommend for that. But I think it does help create a smoother look to my hair and makes straightening it quicker. 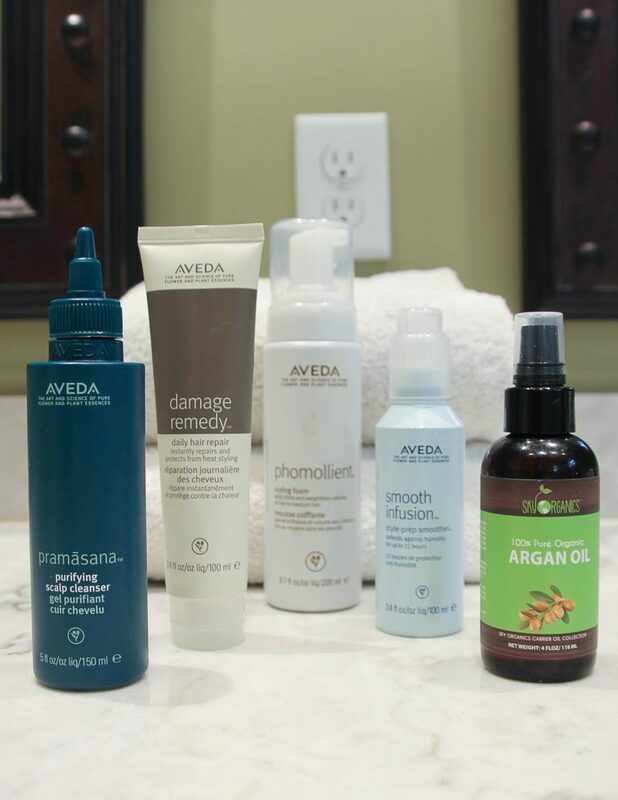 I then move out of the Aveda portion of my routine to apply my argan oil. This product only goes on the very ends of my hair to help prevent split ends and breakage. I have been using argan oil for over a year, and I think this has greatly improved the ends of my hair. I usually wash my hair at night and let it air dry. I do lots of heat damage to my hair with daily straightening. If I can cut out additional heat from a blowdryer, I prefer too. In the morning, I fire up my hair straightener and get to work turning my naturally curly hair into smooth and sleek straight hair. I always use a heat protectant on each piece before I use my straightener. I have tried a few different ones, but I always end up back with this Garnier one. If you were wondering earlier how I only wash my hair 1-2 times a week, this next product I use is the reason. I have raved about it before, and yes it will change your life! 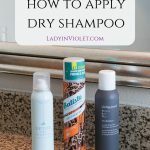 I apply dry shampoo to my roots, anywhere that is looking a little oily. I let it sit and work it’s magic while I do my makeup. Then just shake your hair where the powder is applied, and voila hair that looks clean. 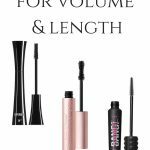 This product can also help add volume. Sometimes I will use it just to give my hair a little volume pick me up. Then it’s on to the last step, curling. Aveda originally sent me their light hairspray. I was impressed with it, my curls usually don’t make it out the door. With the light hairspray, they made it to work. Once I ran out, I decided to try out the stronger hairspray. I love it. Now the curls never stay as pretty as when freshly curled, but they stay. Because of all the straightening I do to my hair, this is a hard thing to find a hairspray to do. My one downside to this hairspray is that the nozzle will clog over time. I have just made it part of my routine to wipe off after each use, and this fixed the problem. Thanks for sticking through this long post. I hope you found a new product or two to try out. 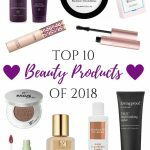 Leave me a comment below and let me know what are some of your favorite hair products. Ya’ll have a great weekend! 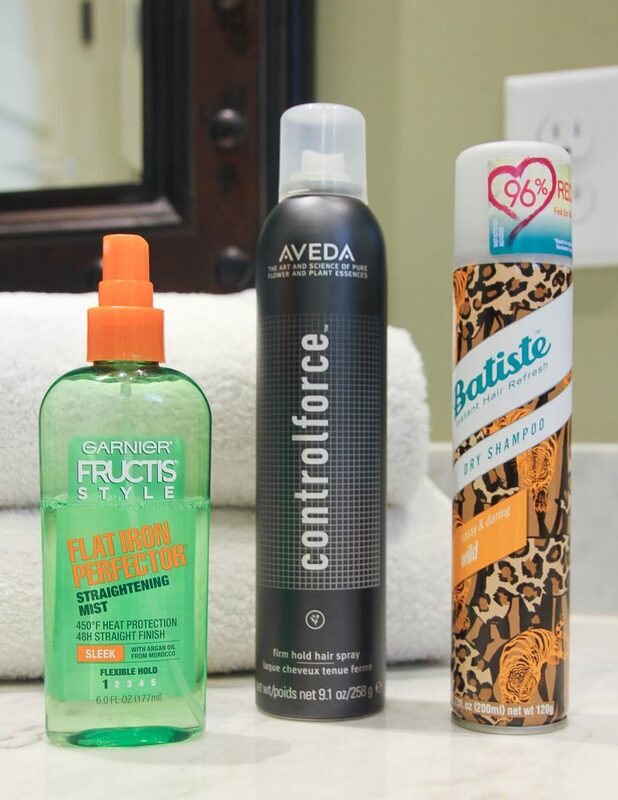 I use the same Garnier heat protectant (like the glossy spray in that same line too). Lots of great info and tips here. 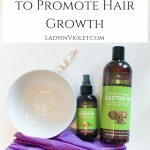 This was a really interesting read, as I am always looking for ways to keep my hair healthier and smooth. I will be looking forward to your post on vitamins and hair thickening products. Thanks for linking up with Fabulous Friday!